Wharfedale PowerCube subwoofers come in threes | What Hi-Fi? Wharfedale has developed a trio of PowerCube subwoofers to complement its speakers. They're available in three sizes: the SPC-8 with 20cm driver; SPC-10 with 25cm driver; and SPC-12 with 30cm driver. You get a choice of seven finishes, all three have Wharfedale's 'infinite baffle' design and downward-firing drivers, with Class D amplification of 150W, 200W and 350W respectively. A motion sensor detects when someone is near the sub and automatically illuminates the top-mounted controls. Peter Comeau, director of acosutic design for Wharfedale's parent company IAG, says: "The aim was to create a range of high-quality powered subwoofers to suit a variety of rooms, tastes and budgets." 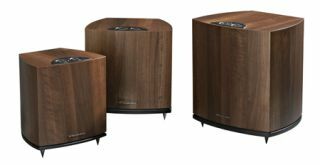 The Wharfedale PowerCube series is available from this month in a choice of seven finishes: blackwood, cherry, rosewood, walnut, cool maple, winter maple and wenge. Prices are £249.95 for the SPC-8, £299.95 for the SPC-10 and £499.95 for the SPC-12.